Should Your Sales Team Only Call Sales Qualified Leads (SQLs)? Hint: No. Information Qualified Leads - These leads are at the awareness stage. They've shared their "information" in order to get some educational information from you. Marketing Qualified Leads - They've investigated your products or services by reading something related to them. Sales Qualified Leads - They expressed interest in talking to a salesperson about their needs. "Smart companies will develop a feel for the right time for sales to reach out to their leads. Obviously all SQLs should be called since they have identified themselves as being ready to talk to sales. Calling IQLs may come across as too pushy or aggressive. However, reaching out to MQLs may make sense and help get more leads converted into opportunities that the sales team can work with and bring on board as new customers." If your salespeople are only interested in talking about their products, then that's the right way to think about it. (You should fire them if that's all they're interested in doing.) Great salespeople are experts and approach prospects in a way that is helpful, regardless of stage. A great salesperson can move a lead from IQL to SQL in 20 minutes. The problem is that most salespeople aren't experts at what they do. Assuming they do have the expertise, they also rarely know how to start the conversation in a helpful way. But, it's simple. For example, when a prospect downloads an ebook, a salesperson can call and ask, "I see you downloaded our ebook on xyz. I am an expert at xyz. What were you looking for help with?" This is often the start of a very welcome sales conversation. A good salesperson should be able to do a little homework about their prospect and find 5 other ways they can be helpful too. Don't wait for prospects to realize they have a problem and raise their hand to talk to you because they've already determined your solution is the best. That's not selling. That's customer service. Great salespeople create demand, not just satisfy it. They pick target accounts and they pursue them persistently and creatively. Prospects supposedly conduct 50% of their buying process these days without talking to a sales rep. Let's not make it more than 50% just because we don't know how to be helpful, or we don't know how to avoid being perceived as pushy. PS. You might have the luxury of sitting back and waiting for your marketing funnel to deliver sales qualified leads to your inbox. Some agencies actually do and it works for them because they only want to acquire a few new clients per year and their marketing is damn good. But, most companies who are serious about growing, would leave a lot of $ on the table if they sat back and waited for SQLs to arrive. Dan Lyons has an interesting article about compensation and equity for sales and marketing leaders. The article states that it's rare to find someone who can lead both marketing and sales. I agree. It's rare to find someone who has lead both and knows the right playbooks for both. Most sales leaders don't know anything about modern marketing. And it's rare to find a CMO that even cares about learning anything much about sales. At HubSpot, we've had the opportunity to learn best practice in both. It's a rare thing to have on the resume, I've found. If I've sent you a link to this blog post by [a personal] email, that means you are probably emailing me incessantly about something that I have zero interest in talking to you about. You missed the mark with your approach. Further, your so persistent that it's actually really annoying. If I could report you to someone that could stop you, I would do that. Further, if you want to improve your sales and marketing effectiveness, try learning about how to attract prospects to you. You can do that through improved sales approaches and/or modern marketing. Update: If you subscribe to my blog by email, I didn't mean this for you. Sorry for confusion. If I sent this to you personally, then I do mean it for you. 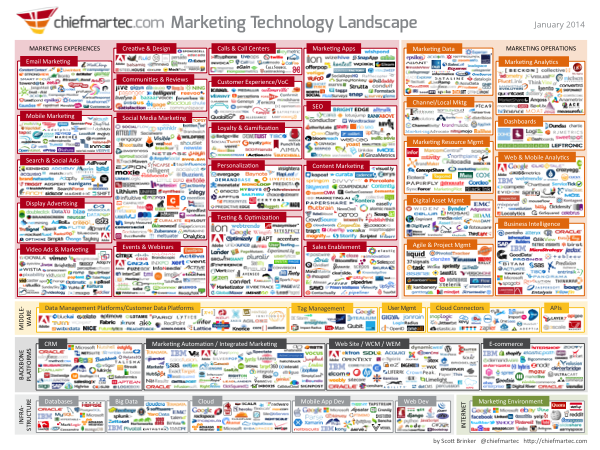 Scott Brinker has released the 3rd edition of his Marketing Technology Landscape Supergraphic. I copied and pasted the graphic below. Crazy, ha? Imagine if manufacturing or accounting folks were subject to this mess? Companies would fail. How the hell is a marketer supposed to figure out what software to buy and use? I don't think it'll be like this forever. Every year, the number of marketing software companies grow. But every year, the number of different types of marketing software companies seem to shrink as different companies enter each other's space by adding functionality. This is the first year that Scott has broken out software into only 6 different categories: Marketing Backbone Platforms, Marketing Middleware, Marketing Infrastructure, Internet Players Impacting the Marketing Environment, Marketing Experiences and Marketing Operations. You can read the full article to see what he means by these 6 different categories. Although there is no perfect way to categorize chaos, it's the first time I've seen someone make any sense of the space so fully. I am completely biased of course, but my prediction is that the "Marketing Backbone Platforms" will eat the space. These companies include CRM players, marketing automation providers, web content management and ecommerce engines. Of course, HubSpot falls in this category as probably the broadest platform with both marketing automation and web content management built in, plus 10s of other needed software capabilities, for seo, social, analytics, etc. Then, the marketing middleware category turns software like HubSpot into a full platform since we have both our own integrations that connect HubSpot's data and functionality to CRMs and ecommerce engines, as well as third party integrations like Bedrock and Zapier that connect us to many more systems. Scott seems to agree that the backbond platforms and middleware will continue to bring structure to the market, "Marketing Backbone Platforms and Marketing Middleware. These two classes of products are bringing some much needed structure to the marketing technology stack." Buyers are driving this consolidiation. No buyer in their right mind would ever want to evaluate and purchase 100s of software products or even 10s of software for one function: marketing. I'd go one step further than Scott and wager that marketing, sales and service will have one software platform. In the near term, the marketing software space will have a winner (or a small # of them) when the software makes it easy for marketers to execute a brilliant marketing strategy; a strategy that supports the sales and growth strategies of their companies. I'd further wager that that'll happen through a proven marketing methodology and an integrated, all-in-one marketing software platform. PS. Another great article from Luma Partners dissects the valuations of marketing tech companies and ad tech companies and shows that ad tech and marketing tech are destined to collide too. As a trained engineer, I love inbound marketing. I love it because it's predictable, measurable and improve-able. You can predict, deliver, then systematically grow the traffic, leads and sales that a company generates by employing a strong inbound marketing strategy. In short, inbound marketing makes sense for my engineer-brain. Recently, Trew Marketing - an agency that serves companies who sell to scientists and engineers - asked me to write the foreward for their new ebook called, Smart Marketing to Engineers via Inbound Lead Generation. It's an excellent ebook. If you're an engineer curious about online marketing, it should make a lot of sense to you. There's even a section called, "The Math of Inbound Marketing". HubSpot launched a new feature last month via a Google Chrome extension. Now, when you're navigating Twitter, you can see which of your twitter followers are also in your HubSpot powered contact database. In the screen grab from Twitter.com below, you can see the highlighted text that says, "View in HubSpot." With HubSpot's social media monitoring and publishing tools, there's not a lot of reason to visit Twitter, except for browsing around. But, I tend to use Twitter by visiting Twitter.com. So, this is a cool way to see which of my twitter contacts are in my HubSpot portal. When I click on the "View in HubSpot" button, I can see much more about each contact. 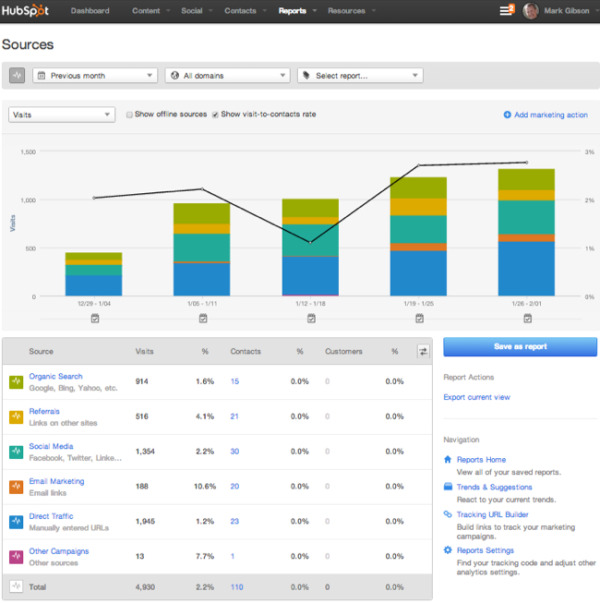 For example, below is a screen capture of Rick's profile from my HubSpot portal. In my HubSpot portal, I can see much more about Rick including: what pages he's viewed on my site; what he's shared with me previously via forms on my site; and information I entered into HubSpot (or my CRM) about him. As a salesperson, I can see how this could help me connect with people on Twitter at the right time with the right message on (or off) Twitter - by using the information I have about them in my HubSpot contact database. With it being one click away, I'm much more likely to go through the effort. You can read about this feature and learn how to set it up on this support article from HubSpot. Most companies aren't very natural when it comes to blogging. They try to make everything a "how to" article or they report things in 3rd person like a journalist. That's pretty boring and un-natural. People don't talk that way. Commerce doesn't get done that way. With this post, I'm going to get back to blogging the way I used to blog: more like a teenager's diary. I'm going to start by sharing some of the conversations I had last week. Met a few new interesting people doing cool stuff and talked to a few old friends. If you're interested in getting some time with me to talk about your sales and marketing, you just have to leave a comment on this post. If I know you and you want an intro to anyone below, let me know. Otherwise, just reach out to them. None of them barked or bit. Neerav Mehta, founder of Red Crackle, a 5 person Drupal web development shop. Neerav and his team are very technical. So they often find themselves working for technical buyers who need help designing and developing custom drupal sites. Steve Ka, of Intralearn. I've known Steve for the better part of a decade now, when we last collaborated on some nightlife promotions. He runs sales and channel development at Intralearn. They are launching a new product that is a lightweight LMS for Sharepoint users called NanoLearn. Any company who uses Sharepoint and needs to verify that their internal teams are learning something can benefit from NanoLearn, especially if employee training is required for legal compliance. Andrew Teman and I had beers last week. Andrew is founder of We Make Heart and was most recently a VP at Hill Holliday. His agency specializes in working with larger brands who are seeking new ideas for grabbing serious share. Andrew has seriously legit experience across traditional and the many facets of digital marketing, and has been helping clients bridge the two. Lots of agencies talk about this. He's done some cool stuff that actually brings digital into the real world and vice-versa. Douglas Barth, founder of SimplyDirect, Jon Kennedy, sales at SimplyDirect, and I spoke for :30 minutes last week so we could learn more about each other's companies. I recently received a personalized message via email with an invitation to take a survey. I would normally ignore these things, but the email was compelling, I was interested in the topic and they offered me a free gift to complete the survey. It was also only a few questions and they offered to send me the results if I took it. I visited the company's site who ran the survey and discovered SimplyDirect, a sales prospecting service that helps companies reach executive decision makers. Rick Kranz of Overgo Studios lead a small group discussion last week, where he talked about his agency's marketing plan for next year. Rick is an online video marketing expert. So, in addition to learning about a few new video creation tools, we talked about the value of video when it comes to making your company more personable/relate-able. Rick told a story about how he walked into a prospect's office and everyone already knew his name. He had never met them, but they had been watching his videos. In order to make his marketing even more personal this year, Rick launched a new blog appropriately called, "Grow Your Business with Rick Kranz" or "Rick's blog" for short. That's it. Did you meet anyone interesting last week? Should I do more posts like these? Want to be featured in the next one? Book some time to talk about your sales and marketing here. There are 3 things I'd like to prove about selling over the next year. Product differentiation drives sales results. HubSpot has been lumped into the marketing automation category by analysts and marketers. We entered the space and by many metrics have taken the top spot. But, we're so much more than marketing automation and marketing automation by itself will not help companies grow in the coming years; a full approach to attracting and converting strangers into buyers is necessary these days. We already do all of that, while everyone else is playing catch up. Further, our product will get even more differentiated over the next year as our excellent product team further builds and broadens our platform. My goal #1 is to prove that differentiation is the key to winning sales. That's hard, though. It's easy to sell things that people are looking for, that they expect. What's hard is selling things that are different. It requires our salespeople to truly be experts at our product, at our industry (marketing) and at selling. Salespeople should help first, sell later, in order to build a massive never-ending pipeline of qualified referrals. Salespeople are notoriously focused on finding low hanging fruit; quick sales that require less effort. They ignore the importance of helping people first. They're quick to run their sales process instead of helping prospect's manage their buying process. They're focused on hitting short term goals instead of long term goals. Too often, they turn prospects off without even realizing it - by showing that they're more interested in selling their product than helping their prospect. I want to teach salespeople that helping first helps them in the long run. I want to teach salespeople how to build a massive pipeline of future deals by creating a circle of people who refer them business because they trust them, like them and respect them. Salespeople should build their expertise publicly, in order to command respect and trust from prospects - more quickly and more easily. I want to teach salespeople how to develop and benefit from having public expertise. One of the smartest things I've done in my sales career is devote time to marketing my personal expertise online. When I had my startup back in the day, I blogged about it. When I joined HubSpot in our direct sales organization, I built the first version of this site to talk about how I was helping my customers. When I started HubSpot's agency partner program, I wrote blog posts, ebooks and put on webinars. This has helped me establish more and more credibility over the years, amongst a small but loyal group of followers. I'd never join a sales organization that doesn't have a strong inbound lead generation team in marketing. But, whatever organization I ever join will most likely benefit from my ability to bring my audience with me. Back in the day (and still these days), salespeople were hired for their rolodex. The new salesperson's rolodex is a personal web presence. What do you think of these theories? Have you already proven any of them? Interested in helping to prove any of these with me? Anyone Want to Talk About Sales & Marketing? Book me Free. I've blocked off a few hours each day in the afternoon to make some calls to help people with their sales and marketing strategy. If you want to talk, leave your name and company name below. Leave a link to your Linkedin profile if your company is not easily findable online. Or reach out to me via Twitter @pc4media. You can't be a HubSpot customer or partner. Your company must be 2-200 employees. You can't be a marketing agency or marketing consultant. You have to be in sales or marketing. You must want to talk about sales and marketing. You and your company must be based in North America. That's it. I might not get to you right away. So, please be patient. Feel free to share this with other people who might be able to benefit from my help.